The upper Columbia River starts in Rocky Mountains and flows some 1,243 miles (2,000 km) to its mouth at the Pacific Ocean. 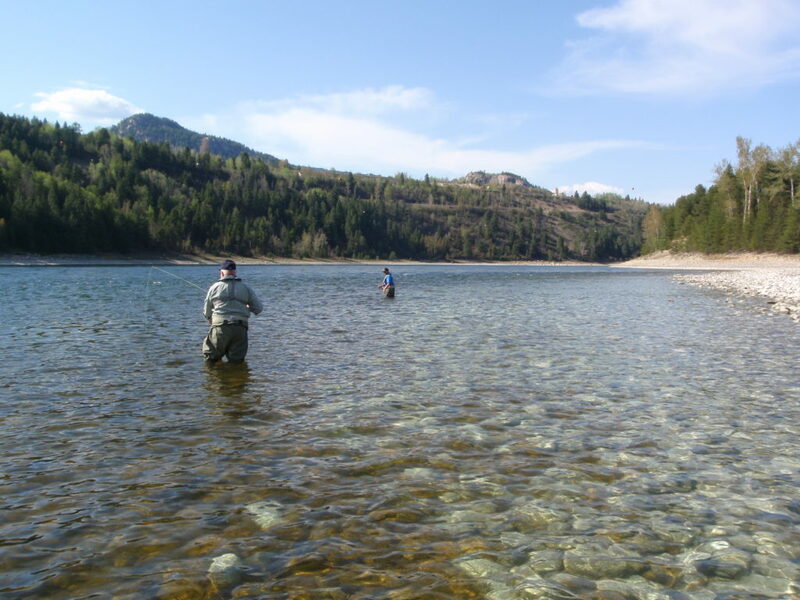 We fish the section of the upper Columbia River stretching some 35 miles (56 km) downstream of the confluence with the Kootenay River to the Washington State/U.S. border. The upper Columbia River in southeastern B.C. is one of the finest tailwater fisheries in North America. 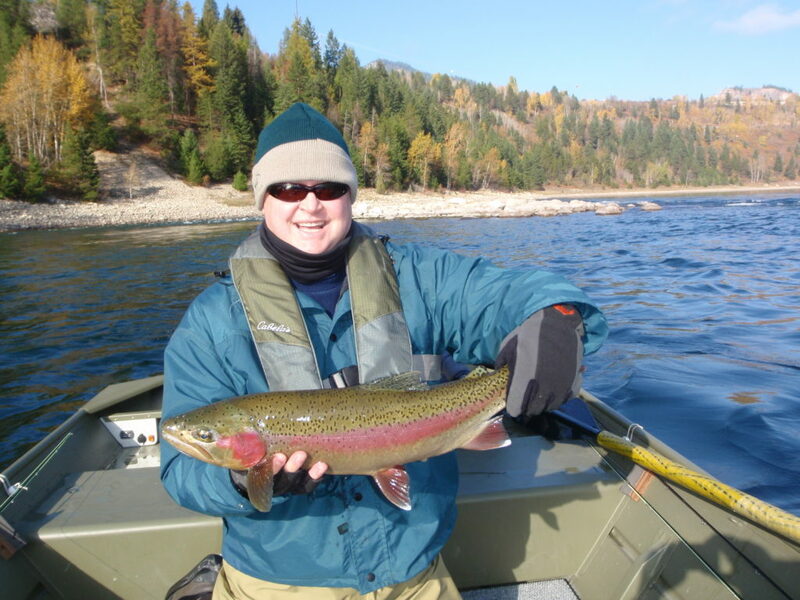 The average rainbow trout landed starts at about 16 inches, with 20-inch fish common. Big rainbows, up to 28 inches, are caught and released every year. We fish the upper Columbia River from our custom built 16 foot jet boat. This boat allows us to power to the top of the runs and drift our way back down. It’s perfect for accessing both shallow and deep water. The boat has the advantage of being rowable which allows us to control the drift down runs, over riffles and lets the guide hold you steady in the most productive waters of the back eddies. 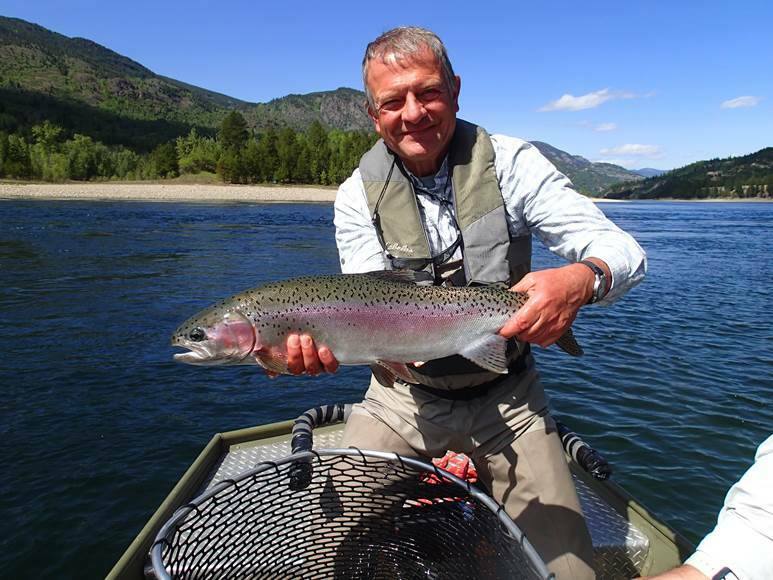 The upper Columbia River is a year round fishery, but the prime months to fish for the largest rainbows are the spring (April, May, June) and fall (September and October). In April and early May, the hatches of stoneflies, mayflies and midges are abundant. By late May and all of June, caddis flies dominate the hatch. In late September through October the water cools from the summer heat, the flows decline and the big rainbows gorge themselves on large caddis and stonefly hatches in the big eddies, riffles and runs. 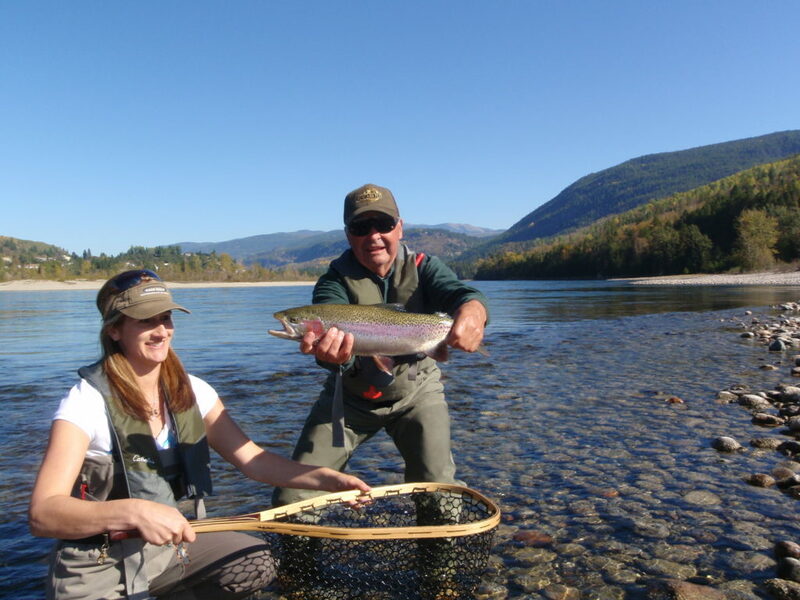 We use a number of different fly fishing techniques on the upper Columbia. Our philosophy is simple; give the fish what they are feeding on. At different times that can be dry flies, nymphs or streamers. We always have three sets of rods ready to go in the boat so that you will be able to fish according to the daily, or hourly conditions. You will have the option of fishing from the broad cobbled shorelines, or from the boat, depending on where you are on the River and the time of year. We also encourage anglers to bring along their spey rods to fish the broad unobstructed shorelines. 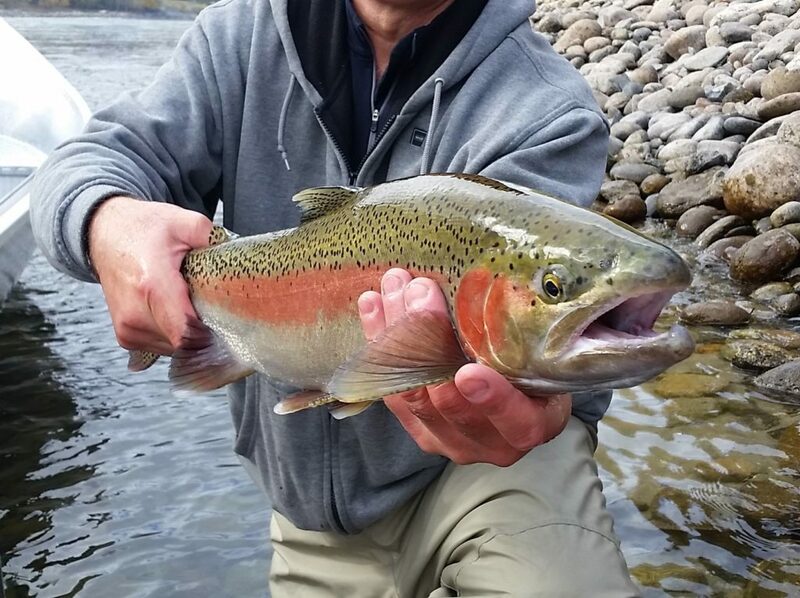 The upper Columbia River is truly an exceptional tailwater fishery. 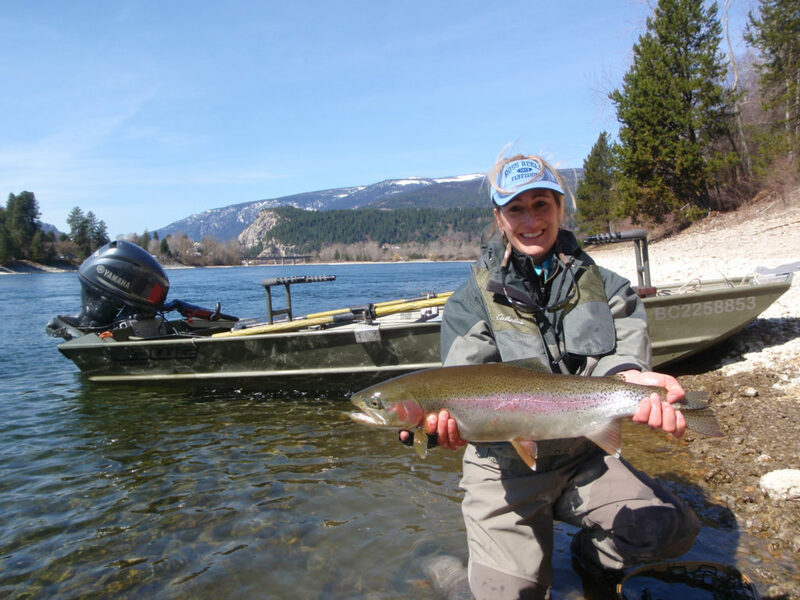 If you are up for the challenge of big rainbows, and aren't afraid to do a little work to catch them, then this fishing experience is for you. We break the 35 miles of the upper Columbia River into four distinct fishing reaches. 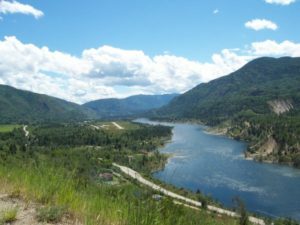 The four sections include: The Castlegar Run, the stretch from Genelle to Murphy Creek, Mary's Run and the Fort Shepherd Flats portion. "Big River, Big Water, Big Rainbows!"